It's been a while since I translated the last piece of fan fiction. This one I like very much, it's broken into two parts. Chronologically the second half takes place after Lin Xi and Xiao Pingjing had their twins, but that child birth piece I haven't had time to translate yet. So, in the second half of this story, you'll meet their half-year old twins very briefly. As for the first part, I thought it would be nice to add in my guess of why Xiao Pingzhang went asking the emperor to grant the marriage with Xiao Xue. In the TV show Pingjing mentioned this when he had dinner with them and his brother and sister in law threw napkins at him. I thought it's a really fun thing to write about. So, enjoy the story with my very own illustrations! On the 28th of the twelfth lunar month, after a year of “free-range” growth at Lang Ya Hall, Xiao Pingjing finally returned to the city of Jin Ling. Riding as fast as he could, he was covered in dust and feeling his bones were about to dislodge from his sockets. Though it was exhausting rushing his way home day and night, as soon as he imagined the consequence of not getting home before New Year, all the pain magically vanished. By his calculation, he should have arrived at the capital two days sooner. Unfortunately, changes were always faster than plans. He ran into a land slide on his way which stranded him for three days waiting for the road to clear. On this evening, he managed to beat the closing city gate by a fraction and finally returned home. Lights were already lit by the time he arrived at the front gate of the Chang Lin manor. He was freezing and starving with only cold winds in her empty belly, all he could think of was a bowl of steaming soup and a warm bath. When he entered his parents’ quarter, however, his lord father’s deep bell-like voice was echoing loudly in the courtyard. Da Ge (oldest brother) was getting a scolding, how rare! Xiao Pingjing grabbed butler Zhou in a flash, stopping the old man from announcing his arrival. He sneaked his way to the outside of the room and stealthily pressed his ear onto the window frame. There was no way that Xiao Pingjing could hold himself back upon hearing the word “marriage”; he dashed in to the room like a shooting arrow. Xiao Pingzhang was kneeling on the ground, surprised by the unannounced arrival of Xiao Pingjing. Judging from his younger brother’s weathered looks and riding cape, he must have only just arrived. He winked at Xiao Pingjing, trying to warn him about keeping quiet, yet he was still one step too late to stop his younger brother’s blabbering. “You! Good you still remembered to come back!” Xiao Tingsheng raised his voice; his tone sounded even harsher than when he was scolding his eldest son. “Greetings to lord father! It’s been a while, is everything going well?” Xiao Pingjing kneeled and bowed down to the floor, before he could raise up however, Xiao Tingsheng stopped him with a quick gesture. Xiao Pingjing knew he was at fault on this, so he kept silent and bent his head low. Before his could finish his sentence, the rustling of clothes announced the arrival of Lady Chang Lin. Her steps sounded gentle and firm, with two maids following behind, she entered the room. “Mother! Greetings !” Xiao Pingjing’s eyes curled into two thin arch upon seeing his mother. He bowed down to the floor again. “You’re home! Let me take a closer look.” Lady Chang Lin held Xiao Pingjing’s face, brushing off a smudge on his cheek with her thumb while helping him up. “You’ve grown taller, and skinnier. My Pingjing is looking ever more dashing.” She petted him on his head and grabbed his hands, staring at her boy with love and pride, completely ignoring the fact that Xiao Tingsheng was still trying to teach her sons a lesson. “Father!” Xiao Pingjing was already famished, “no food” sounded like a thunder that cracked over head on a bright and clear day. “My lord!” Lady Chang Lin turned around, knotting her long brows together, her delightful voice echoed with a tint of complaint. “My lady, I’m being lenient since it’s approaching New Year. You can’t spoil them like this!” Xiao Tingsheng looked much more relaxed when talking to his wife, but his tone was till serious and resolute. She knew that her husband was a man of his word, besides, they had long before reached an agreement that when it came to discipline their children, they would each take on a role to play. She sighed and shook her head slowly, giving up on arguing with him. The night was dark; the oil lamps burned with their weak beady lights. 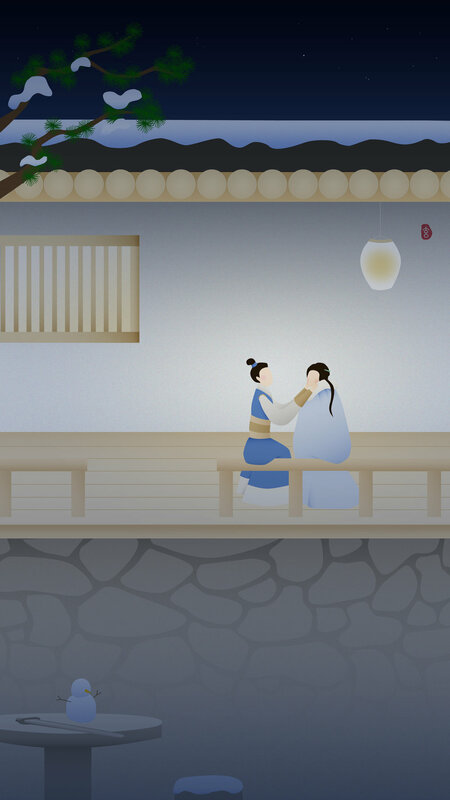 Xiao Pingzhang and Xiao Pingjing kneeled in silence in front of the letter-less tablet in the ancestral shrine. Jin Ling in winter is damp and cold; there was no brazier in the room either. Xiao Pingjing was cold and hungry, feeling bitter, he sulked with a childish pout on his face. Xiao Pingzhang stared down his own nose tip, hardly moving a muscle, waiting peacefully for the two hours to pass. Xiao Pingzhang raised his head slowly, glaring at his brother. Xiao Pingjing rolled his eyes, he was used to such reaction from his brother. “You don’t know when to stop, we’ll talk another time.” Xiao Pingjing sounded calm and firm, he turned around, keeping his posture straight and his mouth shut. Of course he knew his action was inappropriate. It was against the proper rituals and procedures, let alone it was also disrespectful to Xiao Xue. The heir to the Chang Lin House, the intelligent young man who always knew how to act properly and never gave elders any trouble , somehow went ahead with such a daring move. Not only did Xiao Tingsheng not see it coming, even Xiao Xin (The emperor) was stunned. He watched this nephew growing up, knowing all too well that he was well cultured and wise beyond his age. To his sudden and unreasonable request, the emperor responded with a stern face without giving a clear yes or no answer. He appeared angry in front of Xiao Pingzhang while in reality he was more shocked than upset. What Xiao Tingsheng couldn’t understand was also what Xiao Pingjing didn’t grasp. The daughter from the Meng House and the heir of Chang Lin are a proper match. A potential marriage can be arranged following the common practice. Xiao Pingzhang’s insolent action made no sense at all. What they couldn’t have known was that on the morning of that day, Xiao Pingzhang ran into a few Xun House servants shopping for deer skin in the East Market. He didn’t register what was going on first, and only realized something was off after his horse had already walked past them a dozen steps. Deer skin was not something needed for New Year’s celebration, but when it came to betrothal gifts, it became a must. The only child at the right age for a marriage in the Xun family was Xun Feizhan, if his uncle was preparing for a proposal, then…Xiao Pingzhang turned around his horse and ran back to the leather shop. It took him little effort to coax some useful information out of the servants, which further confirmed his suspicion. Be the first to strike is the secret to win the battle. He rode straight for the palace without going home first to change into his formal clothes. He was well aware of the fact that the emperor would never agree to such an important matter on a whim, and he was probably heading for a scolding. However, as long as he was the first one to mention this proposal to the emperor, it basically guaranteed his upper hand. Since the emperor was always partial towards the Chang Lin House, after knowing his nephew’s interest in marrying Meng Qianxue, the emperor would almost certainly deny the request for a marriage between the Meng and the Xun family. Though Xiao Pingzhang was a close friend to Xun Feizhan since childhood, when it came to Xiao Xue, he was not about to leave anything to chances. After the two-hour worth of punishment, Xiao Pingjing returned to his own quarter sad and tired. To his delight, his mother and Meng Qianxue were both waiting inside with wide smiles on their faces; what was even better was that a bow of milk curd and a plate of cakes were waiting for him on the table. Though it wasn’t hot soup or proper dishes, it was already the most precious gifts in the eyes of the starving Xiao Pingjing. He thanked heaven and earth for the kindness of his mother and Meng Qianxue. “Thank you, mother, you are THE parent who really cared about me!” He mumbled with food in his mouth, which he only managed to swallow with the help of a cup of tea. Meng Qianxue was never a shy person and she had heard such jokes often. Perhaps it was because of Xiao Pingzhang’s surprising act during the day, or maybe it was because she hadn’t seen Xiao Pingjing for over a year and he brought up such a topic as soon as they met, she felt her cheeks growing warm, and bent down her head to hide her embarrassment. “Are you angry with me? My apology!” He raised his hands high, bowing down to her like a well behaved child. “You don’t even shut up with all this food in front of you!” Meng Qianxue wasn’t really annoyed at all. She laughed and pushed the dish closer to Xiao Pingjing. He grabbed a cake and bit a large chunk off. “Well then, when you grow up, what kind of wife would you want to marry?” Lady Chang Lin looked at him with a gentle smile, clearly teasing him for fun. Xiao Pingjing was only twelve then, the only thing he wanted was to become a martial art master, roaming the world with a sword on his back, serving justice and be known for his skills and deeds, he had no clue about what marriage or wife entailed. He blinked blankly, rubbing the sugar and flour off his palms. Meng Qianxue and Lady Chang Lin laughed with their sleeves over their mouths; outside, Xiao Pingzhang had been eavesdropping for quite a while, upon hearing such a childish remark, he too began to laugh. As soon as Xiao Pingjing stepped into the inner courtyard of Ji Feng Hall, Lin Xi’s clam and collected voice flowed into his ears from the north room ahead, he could make out the outline of a man who was on his knees, being scolded by her. “…the preparation for this herb is complicated, it needs to be boiled for nine days without stopping, otherwise the poison couldn’t be fully remediated. It would not only reduce the herb’s medicinal effect, it might even become harmful to the patient. If I wasn’t quick to catch your mistake and these herbs were released into the market, what kind of consequences would Ji Feng Hall face?” Lin Xi always talked with a steady and cool voice, but it never took away the power of her speech. The young apprentice was only a teenager, he was unable to even move a muscle under Lin Xi’s forceful aura. Xiao Pingjing winced and gasped, feeling a sense of relief coming over him. Thank heaven he was only her husband, not her student. He walked onto the roofed corridor, the noise of his foot steps made Lin Xi stopped talking momentarily. She looked up and saw him entering the room with a swaddled baby in his arms, bringing in a gush of cold wind with him. Xiao Pingjing was already pulling on the tied strips around his neck; the apprentice boy stood up quickly and took the fur collared cloak Xiao Pingjing handed over. Lin Xin glanced at the boy and shook her head gently. “Yes.” The apprentice bowed and replied, exiting the room obediently. Xiao Pingjing sat down beside her, handing the tightly swaddled Xiao Jie over to her. Lin Xin undressed the swaddle open trained speed and accuracy, she gave the baby a thorough check-up and found no problem at all. “You could always learn, a teacher is living under your roof, you don’t even have to pay!” Lin Xin joked with a spark in her eyes. That was a really difficult question to answer. Although on the surface, they were Prince Chang Lin and Princess Consort, no one around them ever called them by such titles. Lin Xin was called Master Lin or Doctor Lin by everyone, as for Xiao Pingjing, the employees of Ji Feng Hall called him Second Young Master, a name inherited from the old days. As someone who couldn’t even run faster from the court matters, the title Prince was too obnoxious for his taste. Usually, a Master of a business such as Ji Feng Hall was a man, and his spouse then would be called Master’s Wife. Yet in Lin Xin’s case, she is herself the Master and the wife, and no one could think of an appropriate title for the Master’s husband. Therefore, they eventually resolved to his old title. Xiao Pingjing didn’t care much for the formalities, occasionally though, he’d worry about the fact that one day his children would grow up, if by then he was still called Young Master, it really would sound very strange. As expected, in Ji Feng Hall, Master Lin is the true authority. Xiao Pingjing worked diligently for a couple of hours. He was only able to take his son home afterwards, by which time the baby was already fed and fast asleep. Xiao Pingjing and Lin Xi’s small household in Lang Zhou was only a few minutes’ walk from the Ji Feng Hall branch. Though it was only a three-court-yard house, the residence was elegantly arranged and decorated. Lin Xin often prepared herbs and received patients at home, making the place smell very much like a herbal shop. Aunty Qi was a hired helper after Lin Xin gave birth to the twins, with two servant girls, two servant boys and a butler, their small household was a complete and functional home. Far different from the princely manor he grew up in, where he was constantly surrounded by maids and nannies, Xiao Ruo and Xiao Jie were almost fully brought up by Xiao Pingjing’s himself. The children were almost six-month old, and Xiao Pingjing had already grown used to waking up in the middle of the night, changing his clothes a few times a day, holding toys in his hands at all times. It wasn’t a stretch to claim that he had spent more time taking care of the children than Lin Xi had. She went to work at Ji Feng Hall in less than a month’s time after she gave brith. In the beginning she would only go every five or six days, then it became more and more frequent. Now she went there every other day, and usually stayed there until sunset. A household like this was probably none heard of throughout the kingdom of Liang, let alone in Lang Zhou. As he anticipated, Lin Xin didn’t return until late evening that day. The servant boy saw some fresh fish for sale at the local market and brought one back, Xiao Pingjing was just in time to run into him when he returned. Seeing the wiggling fish in the boy’s hand, he suddenly had the urge to show off his skills and headed for the kitchen. The east room in their private quarter was their usual dinning place. Lin Xi recognized the dishes were prepared by Xiao Pingjing’s the moment she laid her eyes on the table, casually, she praised each and every one of them as she poked her chopsticks at the food; the husband’s face brimmed with pride like a child. During the reclusive years at Lang Ya Hall, Xiao Pingjing was often bored. To kill the abundant time he had on hand, he learned cooking for his very skillful sister in law. Though a gentleman was not supposed to even get close to the kitchen (see note.1), the Old Master of Lang Ya Hall was the least rule-abiding person there was. Naturally, nobody even thought of it as a problem. After Lin Xi and He got married, she made quite an effort to learn from him, but all her attempts ended in some form of unexplainable failure. Eventually, she accepted the fact that she had no talent in cooking, and happily handed over such tasks to her prince husband. “New Year is approaching, is Ji Feng Hall going to close for a while?” Xiao Pingjing picked off a chunk of fish belly and put it in Lin Xi’s bowl. “Yes, we will close in a few days and re-open after the 15th, so it’s been rather busy lately. ” Lin Xin smiled and accepted his offer, she very much enjoyed such treatment from her husband. Xiao Pingjing hadn’t spent a New Year with family around him for many years. Since his brother’s passing, his sister in law moved to Lang Ya Hall and he was guarding the northern border on his own, leaving his father alone in the capital. When his father passed, he moved to Lang Ya Hall, and no one celebrated New Year up there in the mountains. Afterwards, he traveled with Lin Xi to write her herbal books, spending every New Year on their way. The coming New Year was the first one in a long time that he would spent at “home”, yet this home and his previous home at Chang Lin Manor couldn’t be more different. Lin Xi kept her usual calm expression, but the subtle shift on Xiao Pingjing’s face and how quickly he changed topic were clearly registered by her. After dinner, Lin Xi went to check up on the babies, she waited until they fell asleep and quietly sneaked out of the room. Xiao Pingjing was practicing his sword in the courtyard as usual. Lin Xi held the collar of her cloak tight and wrapped herself warm inside the heavy fabric. She stood under the roof, watching his shadow dancing across the space. Many years ago, in the inner courtyard of Ji Feng Hall in Jin Ling, the white gravel splattered among the shadow of the bamboo grove. The blade in the young man’s hand flashed like bright snow under the moon light, making every onlooker captivated by his charm. Now, in this small courtyard, with limestone paving the surface instead of the white gravel, twisted pine trees stood instead of the bamboos. The man was no longer a youth, but his blade was sharp and swift as ever. He wasn’t drunk tonight though; time had bestowed a touch of fineness to his movement in place of the blunt and raw impulse of his youth. Finishing up his practice, he flipped his wrist and elegantly pushed his sword back into its sheath. Noticing Lin Xi was watching, he smiled and ran to her in a few strides. He sat down with her on the railings of the roofed corridor and stretched out his hands to hold her freezing red cheeks. His palms burned like fire after a work out. “You’re freezing! Let me warm you up.” Xiao Pingjing held Lin Xi’s small face and refused to let go. She gently pushed his wrists aside after he had his fun of toying with her face. Xiao Pingjing felt a tug on his heart and broke into a smile. He grabbed onto Lin Xi’s small hands under her cloak. “Sure, we’ll go together.” Xiao Pingjing fell silent for a moment as if his mind was suddenly somewhere else. “What is it?” Lin Xi asked. “Nothing, I just remembered, when I was young and studying at Lang Ya Hall, there was one year when I almost didn’t make it home before New Year. I was sent to kneel at the ancestral shrine for two hours without dinner. Back then I thought New Year’s celebration was such a tiresome thing that I was forced to do every year, but now…” his voice grew fainter and fainter as he spoke, the happy old times began to resurface as he talked on. Lin Xi freed her hands out of his grasp and grabbed onto his hands instead. Pulling them close to her chest, she laid her head on his shoulder, pushing the corner of her forehead against his lower jaw. Xiao Pingjing had long forgotten he had once said such a thing. The person beside him was nothing like what he had hoped for all those years ago. Lin Xi was cool and collected, hopeless at cooking, she would never practice sword with him, instead she always ordered him around for chores. Perhaps heaven really did hear his request and decided teasing was the best response. “Don’t worry, in the days to come, there will be no shortage of tiresome things for you to do.” Lin Xi breathed in his warm scent, rubbing her head gently against his neck, she held his hands tightly in her grip.